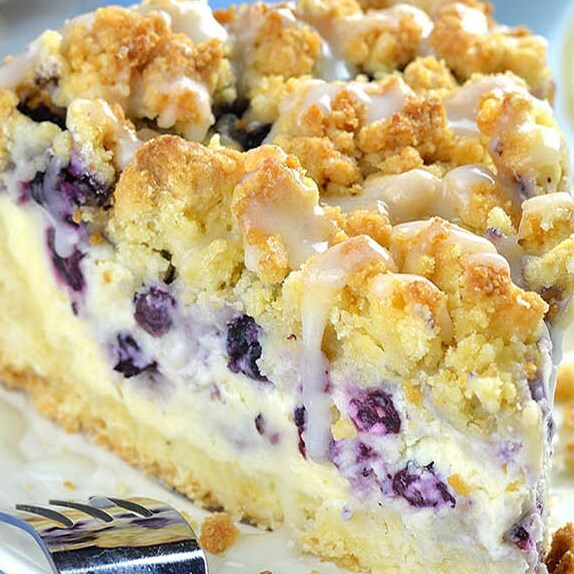 Blueberry Cheesecake Crumb Cake is flavorful combo of two scrumptious pastries: morsel cake and blueberry cheesecake. With this basic and simple pastry formula you'll get two cakes pressed in one astounding treat. Velvety and smooth cheesecake is overflowing with blueberries! The outside layer and garnish are produced using a similar blend, which implies considerably less work and grimy dishes, as well. Be that as it may, this isn't the first run through for me to include cheesecake filling in a piece cake. It's such a decent combo!!! Velvety filling caught inside wet cake with crunchy streusel morsel on top is overpowering! Be that as it may, this time I over-burden my piece cake with filling and made an extremely liberal layer of cheesecake filling. All things considered, there's more filling than outside layer and garnish in this cake. In any case, this Blueberry Cheesecake Crumb Cake turned was stunning. So delectable thus tasty!!! Blueberry Cheesecake Crumb Cake is delightful combo of two divine treats: morsel cake and blueberry cheesecake. With this straightforward and simple pastry formula you'll get two cakes stuffed in one astonishing treat. Preheat the oven to 350 F. Line the bottom of 9 inches springform pan with parchment paper, spray bottom and sides of the pan with nonstick cooking spray and set aside. In a large bowl stir together flour, baking powder, salt, brown sugar, sugar and lemon zest. Add butter in dry ingredients mixture. Now, you can work it with hands, or press with a fork, or you can use the mixer. Work it until it’s grainy. To make the filling mix together cream cheese, mascarpone, vanilla, sugar and corn starch just to combine. Add eggs and mix just to combine, do not overdo it. Pour half of the cheesecake mixture in chilled crust, scattered about 2/3 cup of blueberries over the filling. Spread remaining cheesecake mixture. Top with blueberries and remaining crumbs. Bake at 350 F until golden brown and toothpick inserted in the center comes out clean, about 65-75 minutes. If it starts browning too much tent the top with aluminum foil. To make the glaze stir together powdered sugar and milk or cream. If it’s too thin add powdered sugar, if it’s too thick add more milk.